All original vintage Cyma with rare bumper automatic movement. 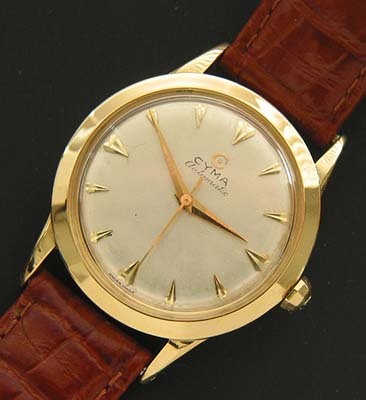 Many watch collectors are already familiar with the brand Cyma, they have a long heritage of being a higher echelon mid-grade Swiss manufacturer. 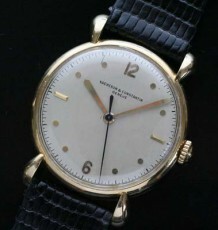 This solid 18 karat gold watch with a heavy screw-back case is a prime example of the company is so well known. Design details like the extra wide bezel around the dial, the long tapered lugs and the multi facetted winding crown all add tremendous charm to the watch. There is slight patina to the dial but it is certainly not distracting. 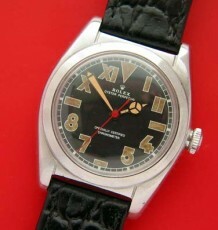 The all original dial has large arrowhead hour markers and period correct pointed dauphine hands. 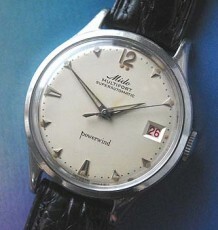 The watch dates to the mid 1950s. 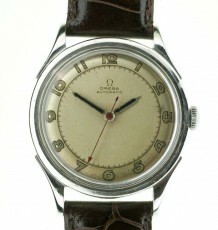 The Cyma calibre R420 movement is one of the few bumper automatic movements used at the beginning of the automatic era. This movement is pristine in appearance and performance. The watch was just serviced and is running well. The case measures 34 mm wide by 42 mm long and is supplied on your choice of black or brown leather straps.